Fresh powder! Lots of new snow - perfect for snowboarding! Indulge in the luxury of this completely renovated Tamarron condo. The complete floor to ceiling remodel was finished in November 2013, including remodeling the exterior as well. We used high-end furnishings and appliances to complete the look. This is a beautiful and spacious 1920 square foot condo with 3 bedrooms that can comfortably sleep 10. The bedrooms feature 1 King size bed, 3 Queen beds, and 1 Queen sleeper, all of which have a Tempurpedic-quality memory foam mattress and pillows. There are 3 full size bathrooms, 2 with walk-in showers and 1 with a full size bathtub. For your convenience, you will also find a hair dryer in each bathroom. There is also a full size washer and dryer in the unit, as well as a full size refrigerator with ice maker, oven, microwave, and dishwasher, The dining room table seats 8 while the breakfast bar seats 3. There are lounge chairs on the large balcony with scenic views, ideally located on the golf course. Additional features of the unit include ceramic tile floors throughout with carpet in the bedrooms and loft. The condo includes a new 85 gallon hot water heater and 40 gallon hot water heater to ensure plenty of hot water for everyone. For entertainment during your stay, you can enjoy watching TV on the 55” flat screen in the living room or a 40” flat screen in each bedroom (cable TV included). The condo also includes WIFI with an upload speed of 4Mb. You may also enjoy watching Netflix or DVD's, or select a game from an assortment of family board games provided in the condo. There is also a small library of books available for reading. 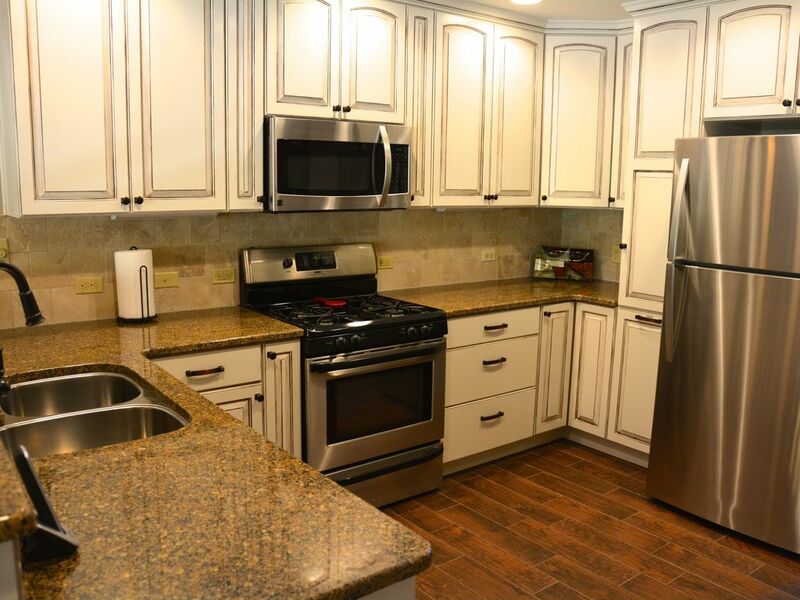 The kitchen is fully furnished with everything you will need including dishes, silverware, cutlery, pots & pans, mixer, blender, crockpot, coffee maker, and tea maker. Towels and linens are provided. During the winter months, there is snow removal from the parking lot. Additionally, the ski resort offers a ski shuttle which will pick you up from the front door of the main lodge. Additional details will be provided at time of booking. There is parking for 2 vehicles directly in front of the unit. The Valley Fitness Center & Pool, adjoining the south end of our Main Lodge at Tamarron, features a year-round outdoor heated family pool and hot tub, as well as space to take in the sun and relax. Indoors, you will find a state of the art fitness center, complete with separate spaces for cardio, weights and classes. There is also an indoor lap pool and locker rooms with steam showers and saunas. A relaxing massage and spa service center is also located in this space. Outdoor playground and gas fire pit areas are available for your enjoyment. Tennis is available with 1 day advance sign-up with no court fee. Our guests now have the ability to play golf at the Glacier Club's Valley Course at a discounted rate of $135 for 18 holes with a cart. Originally designed in 1975, The Valley Course is an 18 hole course at the Tamarron Resort that offers world class golf at 7,400 feet above sea level. This course is currently open only to members and Tamarron Guests staying in this designated "golf" room. Additional details will be provided upon request. Please check out our newest property listed on HomeAway/VRBO in this same Resort (Property #4092761). There are also additional scenery and recreation pictures there as well. After our first trip to Durango, we instantly fell in love with everything about the area. The mountains, the scenery, the various activities available during all seasons make this the perfect getaway for our family and friends. From snowmobiling to white water rafting, horseback riding to fishing, there's something for everyone! We know you'll enjoy it as much as we do. We are located 20 minutes north of historic Downtown Durango along the Million Dollar Highway. The Tamarron Resort is set amidst the red cliffs, tall pines and shimmering aspen making for a truly beautiful setting - you will really feel like you are escaping to the mountains! Our neighbors within 10 minutes are the Rapp Corral, Purgatory Resort, the Rockwood Station for the Durango & Silverton Narrow Gauge Railroad, Haviland Lake, Honeyville, Trimble Hot Springs, Dalton Ranch Golf Course, and numerous hiking & biking trails. Completely remodeled from top to bottom with high-end appliances and furnishings. We designed this condo to be a luxurious retreat! NOW FEATURING golf course privileges at the Glacier Club's Valley Course available for a reduced fee to condo guests. All 3 bathrooms are full size, 2 with walk-in showers and 1 with a full size bathtub. For your convenience, you will also find a hair dryer in each bathroom. Towels are provided. Bed linens are provided, with extra blankets and pillows. Full size washer & dryer are included in the laundry room, and some detergent and fabric softener may be available. Valley Fitness Center & Pool CURRENTLY CLOSED FOR REMODEL - ANTICIPATED OPENING DATE OF JULY 4, 2018!! Brand new with ice maker and water filtration inside door of refrigerator. Toaster and other small appliances are available including a crockpot, blender, and waffle iron. Some basic spices and seasonings are provided, along with dish soap and laundry detergent. Fully furnished with everything you need (cookware, serving dishes and utensils, dishes, glasses, silverware, cutlery). Cable TV is included on all TV's. Complimentary ski shuttle for Durango Mountain Resort will pick up at the lodge during ski season (must book/confirm the day before at the Front Desk). The Glacier Club's Valley Course is an 18 hole course that offers world class golf at 7,400 feet above sea level. Guests now receive a special discounted rate of $125 for 18 holes with cart. This condo was the perfect destination for a two family ski trip. It was well equipped with everything we needed (even had coffee filters & laundry detergent, which is a huge plus!). The beds were all very comfortable, as well. We were quite surprised with the large space & Hills directly behind the condo. The kids had a blast playing in the snow there & even went sledding a bit. The kids also really enjoyed the indoor pool & outdoor hot tub! In addition, the complimentary ski shuttle was super convenient to and from Purgatory ski resort. We think we’ve found a gem in Purgatory & would love to stay at this beautiful condo again! Very large and very nice and equipped! A beautiful home with plenty of space and beds for everyone! The view from the patio was breathtaking as well as the drive up to the condo. The experience at Kris Owens Tamarron condo was very nice, warm, modern, and clean. My whole family had a great time and they liked the condo as well. The house warms up very quickly and that Was great!!! The memory foam beds were something new for our family to sleep on. Some of us liked it and some of us didn't. It was on the hard side but for others it is perfect! There's a lot of light that comes in the morning since there's a lot of windows! There are also electric roll out blinds that come out to close the major windows in the master bedroom. That was great to have! The only negatives that can be easily corrected is I recommend for the next visitors or the owner to kindly provide or bring hot cocoa, coffee grounds, coffee creamers and sugar if you like that in the mornings since there was nothing there for us to drink in the am. Most stores and restaurants there close early at 9pm. Which is unusual for me coming from Arizona where stores and restaurants close pretty late on weekdays or weekends. So be prepared for that if you are arriving there late at night with no food or water :-). Other than that, this place was perfect. Close in proximity to Durango downtown, purgatory mountain, and other recreation venues. Thanks for everything again! My family and I thoroughly enjoyed our stay in this condo. It was very clean and comfortable for 10 of us. Kris was very easy to communicate with and very accommodating! We hope to go back soon.